A columbarium is a long term investment. It is important that a columbarium continues to look good, and that it is engineered to perform for many decades into the future. Unlike many other products, a columbarium cannot be traded in for a new one, or be easily replaced because of sub-standard performance. 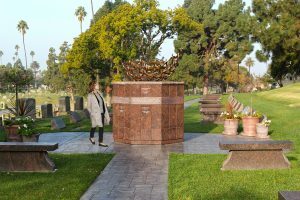 To ensure that the Eickhof columbarium product is engineered to stand the test of time, Eickhof Columbaria, in addition to over 30 years of hands on experience fabricating and installing columbaria, has completed extensive product testing. This testing has been completed by Eickhof Columbaria and by independent testing laboratories. We make sure that Eickhof columbarium component parts are engineered to have the strength and longevity necessary to do the job required for decades into the future. When evaluating a columbarium company, remember that the Eickhof concealed hardware, in conjunction with Eickhof Columbaria’s unique thin wall columbarium fabrication method, allows unlimited columbarium design configurations. The beauty and utility of all Eickhof columbaria is based on one crucial design innovation- the patented Eickhof concealed locking hardware. This simple, yet secure fastening system allows Eickhof’s columbaria to have a smooth, clean, flush surface- free from any exterior hardware or rosettes and gives the flexibility for endless design possibilities. Eickhof’s concealed locking system is fabricated in our manufacturing facility located in Crookston, MN and is constructed of 3/8″ thick cement fiber building board with aluminum shelves. The hardware is concealed by attaching all material behind the stone. This allows for a smooth, flush surface, and also serves as a security feature because the fronts do not appear to be removable, and require a specific tool. Designing and building the highest quality columbarium and ossuarium memorials is our sole focus. We have developed a better way to engineer, design, and fabricate these memorials. Our columbaria, installed domestically and internationally, have been tested for years through exposure to many different climates and weather conditions. This has enabled us to make product improvements based on what we have learned from direct experience. For over 30 years we have provided our customers with columbarium and ossuarium memorials that are more beautiful, requires less future maintenance, and operate simply during inurnment ceremonies. A custom built columbarium can be designed so that it blends with, and is appropriate for, the existing architecture of your space. In addition to granite as a finish material for your columbarium, Eickhof Columbaria can provide wood, bronze, slate, limestone, marble, aluminum, or just about any other appropriate finish material. In addition to columbaria mounted to existing walls, the Eickhof niche fabrication method creates a structural niche cabinet. This allows for free-standing columbarium walls without the need for structural supports or backup walls. Free-standing columbaria can be single sided or double sided. In addition to straight walls, Eickhof free-standing columbaria can be curved, circular, or semi-circular. Eickhof also fabricates double sided columbaria having niches that are placed back to back. The back to back niches share the same foundation and the same capstone. Because the columbaria are designed in a back to back configuration, they are space efficient, and by sharing the same foundation and capstone, they are very cost effective. Eickhof Columbaria has professional installation crews that install the Eickhof columbarium product. These professionals are the same people who build the product in our facility. This means that the columbarium is installed correctly, using the right tools. This ensures that you not only obtain the best quality columbarium, but more importantly, if a future problem does arise, you know whom to contact to assist in making any necessary corrections. When practical, prior to delivery to the job site, Eickhof Columbaria prefers to assemble as much of the columbarium as possible in our manufacturing facility. This allows us to assemble the columbarium free from inclement weather and under controlled conditions. This gives the customer a higher quality product and gives us an opportunity to survey and examine all stone components. This insures that the stone color is within industry standards and that the stone is cut to the correct dimensions and is free from defects. Eickhof Columbaria also manufactures Pre-Assembled columbarium and ossuarium models for exterior garden locations. These columbaria are completely assembled in one piece, shipped to your location on an Eickhof truck with two installers, and then set on your foundation with a crane. The Eickhof delivery and installation crew is there to make sure everything goes smoothly. We insure that the Pre-Assembled columbarium lifting straps are mounted correctly. We make sure that the columbarium is centered on, and sits level on, the foundation. The Pre-Assembled columbaria are convenient and they require less planning and design work then custom columbaria. If required, they can also be easily moved in the future.